Korean artist Do Ho Suh is well-recognized name in the art world, whose work takes him around the world to various biennials, museums and galleries. Home, though, doesn't seem to be far from his mind. For instance, for a current exhibition in Austin, he's created a full-scale replica of his Chelsea apartment in gossamer sheets of transparent polyester fabric stretched over wire frames. He affects a similar transformation of the same place for his show here in New York at Lehmann Maupin gallery (which runs until Oct 25). Only this time, he employs the venerable medium of rubbings on paper. Titled Rubbing/Loving Project: Apartment A, 348 West 22nd Street, New York, NY 10011, USA, the installation required the artist to painstakingly create rubbings of every surface in his apartment. In some cases, appliances (a stove) or fixtures (a toilet) are presented as exploded diagrams, with every element flattened into a maplike scheme. 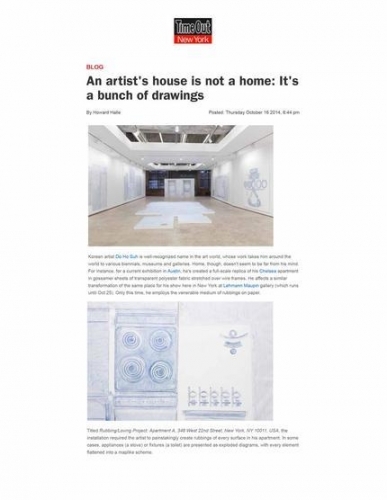 In other instances, he stitched together the rubbings into three dimensions, recreating, for example, his bedroom window as it exists in real space—complete with an air conditioner jutting from the sill. Although the rubbings are concrete records of someone's personal space, they seem ghostly, evoking the basically transient nature of life in New York, where people come and go, and the only constant is change.